This entry was posted on January 29, 2019 by Sew Essential. 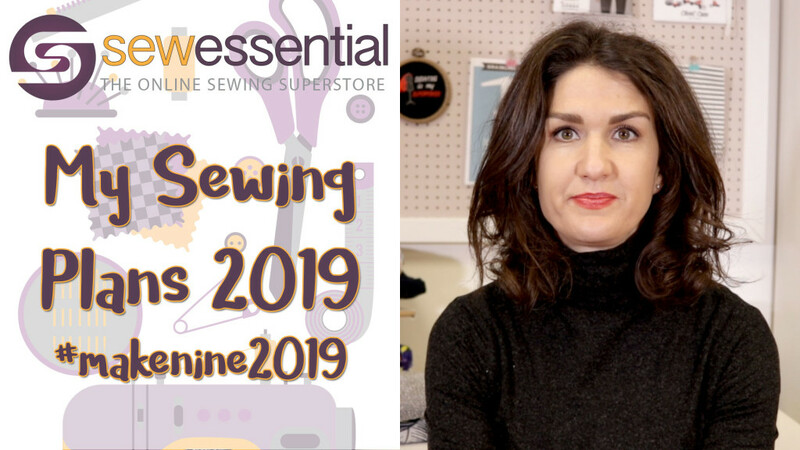 Welcome to the Sew Essential vlog, I'm here today to talk to you about my sewing plans for 2019. As always the patterns and fabrics I mention are available on our site and you can find the link to our website below. Taking on board my learnings from my Makenine 2018 I've decided to start the year by making some skirts. The first skirt I've already started making is this Tilly and the Buttons Ness skirt. It is a classic denim skirt pattern it has yokes, belt loops, pockets and lots of opportunities for top stitching. It comes in a mini or midi length and I will be making mini skirt. The fabric I'm going to make it in is this beautiful needlecord fabric. It's a grey/khaki background, it's lovely and soft and isn't stiff like some needlecord or corduroy can be. It has good drape and movement and good amount of stretch so it is perfect for the Ness skirt and would also be ideal for a Tilly and the Buttons Cleo pinafore dress. A jacket has been on my Makenine list for the last two years. I really want to make one to learn some tailoring techniques, but I'm not sure if I will get around to it due to the time it would take. I decided to keep it on the list and if I manage to make it great, if I don't it isn't the end of the world. If I was going for a quick win jacket pattern I would make the Sew Over It Coco jacket. Otherwise I would love to make a Butterick 6169 The pattern packet isn't very inspiring, but someone I know on Instagram, Sew Manju (you find her on IG and she also has fantastic blog), made a beautiful version of the jacket recently. I would make either jacket in our boucle fabric in black and white which would go with everything. I'm really excited to be able to make something I've wanted to make for a long time, Simplicity 8459 It is a wrap over skirt with a big buckle on the side plus other views to choose from. I've always wanted to make it in leather or a leather look fabric because I saw almost the exact same design in Reiss for about £300. I'm so excited we now have this leather look fabric in so I can make it and try experience something new sewing with this type of fabric. It has an embossed print and is lined with this lovely soft almost fleece like lining. It would also be ideal for bag making. I will need to use a teflon or non stick foot on my machine to work with this fabric. I definitely need more sundresses in my wardrobe and would like to make either the Rosie dress by Sew Over It the or Seren dress by Tilly and the Buttons. Both patterns are very pretty sundresses. The Rosie dress has a boned bodice and fuller skirt, the Seren dress has lots of different views including ruffles and a top and skirt version. The fabric I would choose for either of these dresses is this gorgeous feather print cotton lawn. I think the large print would balance out the prettiness of patterns I've chosen. This is a pattern (McCalls 7740) I absolutely fell in love with last year when it came out. It is a summery dress with a V at the back and a bow on the back. It has a cut out detail and is nice and simple on the front. The fabric I would like to make it with is our Ohio John Kaldor cotton sateen fabric. It is a pretty print but because the dress is simple think it will work well. I made the sleeveless V neck version of Butterick 6206 last year and chose the wrong pattern size. I love the pattern and want to make it again, but to go for the short sleeve crew neck version this time. I think I would wear this over and over again in the summer. I will make it in our John Kaldor navy cadiz fabric. I've realised although I love prints I do need some plain things in my wardrobe too. I will be able to use my coverstitch machine to sew the hems and will also use a neck binding attachment to sew the neckline. I really want to make something with sequins this year. Lots of people I know or see on Instagram seem to have a plain, simple sequin tshirt you can just chuck on with jeans and feel instantly glam and I decided I need one of those. Originally I thought I would choose black or blue sequins, but then I saw Tess Daly on Strictly in an ivory coloured one with jeans and it looked lovely so I think I'm going to go for the ivory. You can see our sequin fabrics here. I think something like a Grainline Scout T shirt would work really well and is something I would probably wear all year round. The next item on my list is a pattern that has been around for a while Vogue 1483. It is a jumpsuit and playsuit pattern. I would like to make the playsuit pattern, which has short sleeves, a V neck and an elasticated waist. I would make it in this beautiful viscose fabric, which also comes in a green colour-way, is super, super soft and I just love the colours. I think a playsuit made up in this would be a really special garment. I just need to make shorts I make the shorts long enough so I don't feel like I have too much thigh on display! I finally got around to making a wrap dress last year and I loved it and wore it all the time so I definitely need to make more. I made woven wrap dress last year, but this year want to make a jersey wrap dress and have chosen Burda 6443. I have always liked this pattern, it is a faux wrap dress with a proper skirt and wrap over top. I would like to make it in something like this John Kaldor Portia fabric, which is a lovely bold design and would work well for this dress. I hope you've enjoyed hearing about my planned makes for the year and I look forward to sharing them with you very soon.